March 2008 John Talbott writes: Unfortunately for us all John, [Le Petit Nicois] came under new management a month or so ago and the chef, ex-Laperouse, was expected to dazzle. According to three food writers who were there the first week, two of whom I know well and trust, it was disappointing. The two I know were Sebastien Demorand and Sophie Brissaud; Emmanuel Rubin was there the same night and hated it too. If you go to their website [link below], you'll also find that the decor has gone air terminal modern, with prices to match. Treasure this review as ancient history. Gaston Wijnen’s pioneering book, Discovering Paris Bistros, published in 1991, strongly recommended a bistro in the 7th Arrondissement which specialized in seafood, Le Petit Niçois. Its bouillabaisse, available as part of a 155-franc menu, was an outstanding bargain. Wijnen ate it with pleasure and returned the following morning to learn its method of preparation straight from la bouche du cheval: seven varieties of fish cut into large hunks, plus a few mollusks and crustaceans; the firmer fish marinated for several hours in olive oil with onions, tomatoes, garlic, fennel, parsley, thyme, bay leaves, pepper, orange peel and saffron; then cold water added and boiled for seven or eight minutes; then the softer fish added and cooked another seven minutes. It was a practical, labor-saving way for a bistro to prepare an evening’s supply (but best for the diner to arrive early). In 1994 I followed up the recommendation. 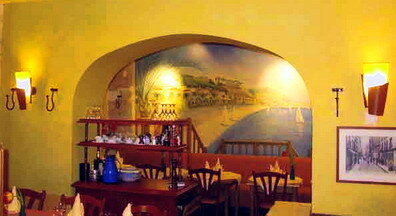 Le Petit Niçois proved to be a cheerful place with a mural of Nice's harbor on the back wall. American accents could be heard from several directions. The bouillabaisse was available on the à la carte menu at under 100 francs. It arrived in a large copper saucepan full of chunks of fish, with a few small clams and half a soft-shell crab. It was not elegantly laid out, but the single portion was enough for two, at a fraction of the cost at more famous establishments. The chunks came out of the pan without falling to bits, they maintained their individual flavor, and the broth was a creditable fish soup in its own right, with generous bowls of rouille, dry toast and the proper grated gruyére that goes stringy in the soup and dribbles down your chin. Over the past dozen years reports continue to reach me that their standards have held up. It still has a repectable listing in Paris Pudlo. The bouillabaisse is now up to 25€, which is very reasonable considering how the cost of the fish has skyrocketed. What you now get, as listed on their web site, are 1/2 tourteau, langoustines, moules, congre, rascasse, gronin, vive, soupe de poissons, rouille, croutons ailés. 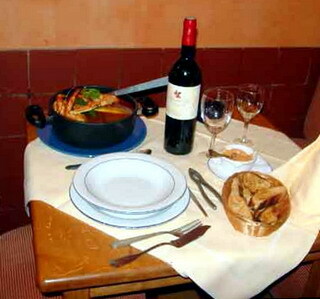 (The picture, looking very much like what I was served, including the iron pot, is also from their web site.) Not the complete traditional ingredients, of course—all those ugly little fish that used to go into the pot at the end of the day are now worth King Neptune’s ransom. Of course, if you’re a wealthy perfectionist, you can still get the whole shebang, including half a local crayfish, at the Restaurant de Bacon in Antibes for a whacking 130€ per person. 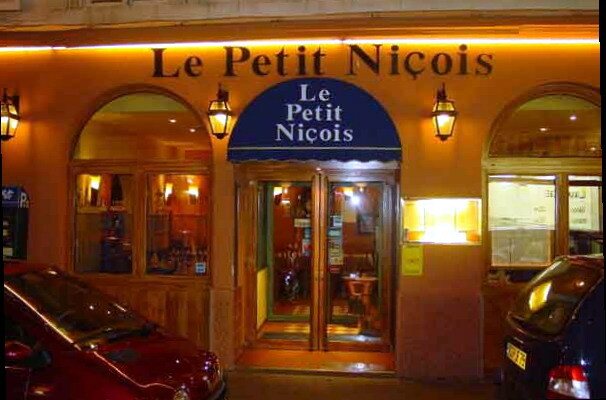 But if you want a good peasant dish at something closer to peasant prices, then Le Petit Niçois is worth a gamble.